Brenda Welburn’s new historical novel for young adults, “The Time Travels of Annie Sesstry: ” (published by Archway Publishing), focuses on a theme of family and history, specifically the idea that who a person is, is not merely because of their personal experiences, but also because of the experiences of those who came before them. The book is available for purchase at: https://www.amazon.com/Time-Travels-Annie-Sesstry-Sly/dp/1480860441. 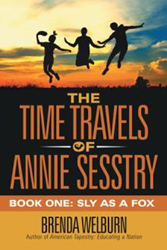 Annie, along with her younger sister and cousin take an unintended trip back in time, where they encounter their ancestors. Annie, Emma, and Josh learn of the challenges their ancestors faced during the Civil War and Reconstruction. Along the way, they discover new insights into their family history and the history of the nation through the eyes of formerly enslaved people.